Pictures of my recent nuno felt top! Slowly, slowly I am finally starting to get back to basics with my newly working computer and all the attendant software. Things like Office 2007 were all wiped out and I had a major panic because I couldn’t find any discs even though I knew that I had purchased all the bumpf. Anyway, without boring you totally sensless I finally managed to find some old emails from Microsoft, realised I had purchased the software online, found the 25 digit product key and voila, I am back in business this morning! Initially I couldn’t get any of the pictures from my phone onto the computer but now that I have updated everything I can finally proceed as if the last 4 weeks never happened, I wish!!! You probably remember I blogged recently about my Japanese inspired folded and stitched top but wasn’t able to upload any pictures at that time, well here they are. The first shot shows the top from the front, this is the kind of loose style of clothing I enjoy wearing myself so hopefully I will get plenty of wear out of this now that I have finally put it together into something wearable! The second image is the top from the back. 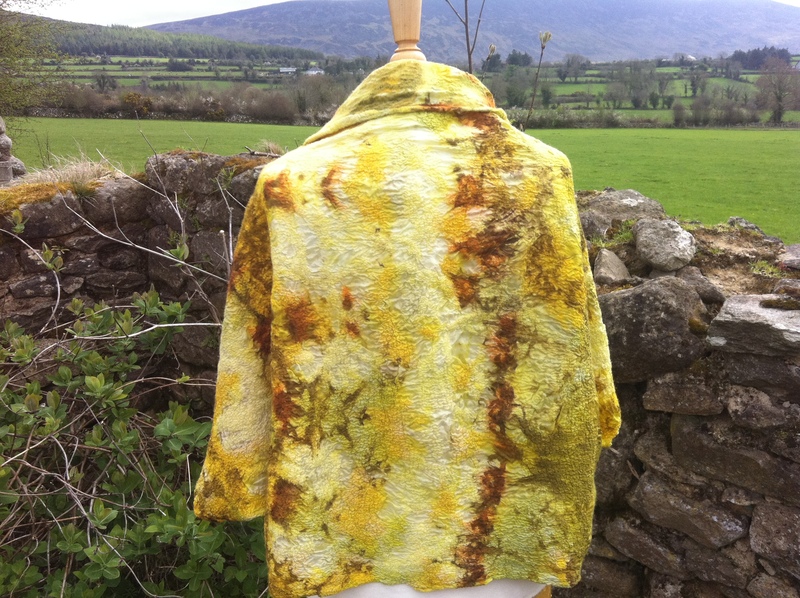 I think you should be able to see how beautifully this piece of ponge silk was dyed by Lyda Rump, I echoed the colours by selecting short fibred merino in complimentary shades and also added silk fibres making the top reversible if desired. 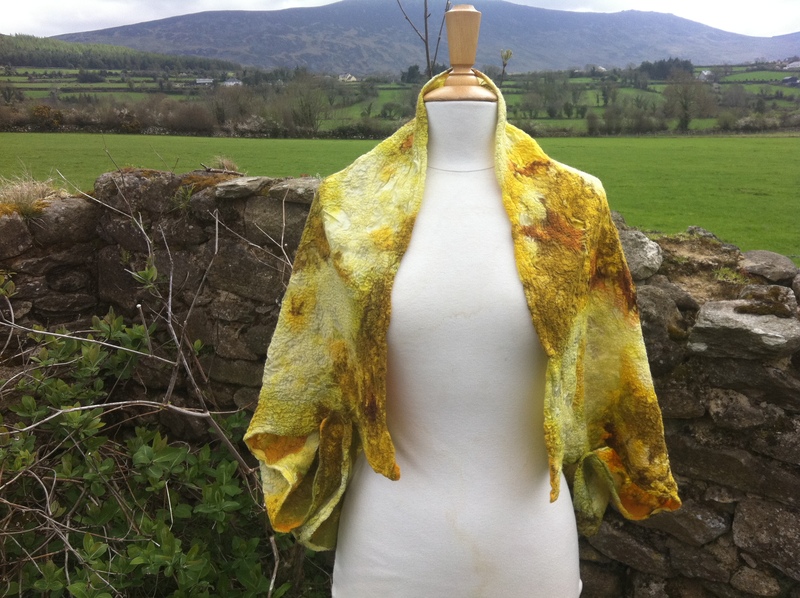 This entry was posted in Felt, nuno felt and tagged Clasheen, Felt, Felting, Lyda Rump, Nicola Brown, nuno felt, nuno felt jacket, nuno felt top, nuno felting, nuno jacket, nuno top by Nicola. Bookmark the permalink. So glad that your computer nightmare is finally over…That must be a load off your shoulders…Hooray!!!! I love the new top…Beautifully dyed silk and color coordinated merino….Great pairing. Hope you’ll bring this top along when you come to Michigan. I’d love to see it on you. This is gorgeous – beautiful colours and textures! I’ve not done much nuno felting so far but am inspired to give it another go. Nuno felting is such an easy technique to master, just remember to be very gentle at the start and then you get to be really aggressive once those fibres migrate through the fabric! Oh myyy…. I just love the died silk. And you said you’re not good in dyeing? /shakes head in disbelief/. Love the top, should be perfect for the summer evenings. I’m glad to hear that the computer stuff is sorted. You can finally concentrate on the book, which I am itching to see. Good luck with it all! I love the silk too but I can’t claim any credit for it unfortunately, master textile artist Lyda Rump was responsible!